The Cornell NanoScale Science & Technology Facility (CNF) is a national user facility that supports a broad range of nanoscale science and technology research projects by providing state-of-the-art resources coupled with expert staff support. Researchers from academia, industry, and government laboratories partake in our New User Training and learn to use the CNF tools available to carry out their research projects — from development to commercial prototyping. The Cornell’s Institute of Biotechnology seeks to catalyze life science research, stimulate biotechnological innovation and foster entrepreneurship locally, regionally and internationally. The Institute manages business development activities for startups and entrepreneurs. 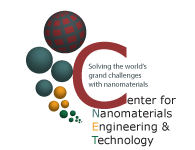 The Center for Nanomaterials Engineering & Technology (CNET) Shared User Facility provides preparation and synthesis tools, analytical instruments, and testing equipment for the scale-up of nanoscale hybrid materials research and development. Open to the Cornell University and Industrial community.